Helen helped us to make the best of our time in Odessa, guiding us on a walking tour of the city, a day trip to the Akkerman Fortress and Shabo winery, and a private guided tour of the catacombs. She is very organised, has excellent English and is a mine of information. Helen was great company, shared many insights into her country and city and provided lots of hints and tips on how we could use our spare day and evenings. Thank you. Helen is a very good guide with fluent English. Nice atmosphere. I strongly recommend this guide. Trip to Dniester and saling by boat is nice experience. Fantastic for nature lovers. There are not enough words to describe how wonderful Helen is. She took amazing care of us. Even adjusting things once she saw what out interest were. I wish she could be my tour guide for every country in Eastern Europe. The information is wonderful and she is a kind person who takes care of every detail. Nothing you need is too much or too difficult for her. Helen was my tour guide in Kiev , Lviv and Odessa . she is a very nice person , perfect guide , full of energy , knowledgeable in each subject , very helpful and she speaks fluent English . without her I could not finish my 13 days tour in Ukraine .. Helen , thank you very much and I wish I can give you more then 5 stars because you deserve more ..
She really assisted about my photography trip and my colleague for the essay. She's very knowledgeable, speaks fluent English and being an empath about the traveler's specific interests. Helen was in any way outstanding - I required medical attention when I arrived in Odessa and Helen got me an appointment with a specialist within a few hours. Couldn't be happier! TOUR GUIDE RESPONSE: Dear Markus, I really happy that I could find help you. Thank you for your review and I know that it is not end of our story and we will continue the project about which you told me. Superb day. Helen & Dennis were fantastic hosts and taught us a lot. It's a long drive to Vulkovo, but relax, enjoy the sights and see it as part of your trip. We were very lucky - went to dinner with Helen's relatives at their house which was fantastic. You're really made to feel part of the family and see how people live. I doubt many other guides would've been kind enough to allow this. Once again Helen/ thanks from me and Hannah, and give regards to the family. TOUR GUIDE RESPONSE: Dear Steven and dear Hanna. You are very kind to put 5 stars. We really liked you. Yes meeting natives its interesting But i want to write here mistakes which i done ( too much to my mind). Next time i will never take tourists to such long way without airconditioner in the car. Next time i will include boad that we can see all nature. Again, ☺thank you that decided put high rate and closed eyes for my mistakes. I want next time ( if you come)to make gift for you-free tour to catacoms. thank you. My guide was a wonderful, well spoken, and sweet woman. I cant say enough about how much I enjoyed my time with her. Her knowledge of landmarks, the city, the history was very good and she had an enjoyable, friendly attitude that was most welcoming to a stranger in a foreign country. TOUR GUIDE RESPONSE: My dear Jim, I also had great time, really))) What I like mostly is that you are very clever and frandly, you can talk about everything and I enjoy your view to music and paiting sides. We have a lot in common. I hope that one day you will back to my sweet city. And thank you for 5stars!!! Can't thank enough to Helen and Dennis for the great ride from Odessa Airport to Nikolaev they gave me. They met me at the airport, got me coffee and a drink later, entertained me with a fun conversation during the whole trip. They told me a lot of interesting things about Odessa and their life in Ukraine. Dennis is a great driver! I asked Helen to get me a sim card and bring it to the airport and she was very kind to do that for me for no additional fee. I feel very lucky to meet Helen and Dennis!! TOUR GUIDE RESPONSE: Dear Natalie, thank you very much for your rate but mostly for your company. You are wonderful girl, very friendly and very open. I am sure that you have a lot of friends. Give best regards to your granny and all your family. I hope that it was our first meeting but not the last. Have great vacation!!! Helen was very pleasant guide. Picking me up at the airport was a very nice touch, not offered by many guides. She helped me to quickly get my bearings. TOUR GUIDE RESPONSE: Dear Colm, thank you for 5 stars. It was great 2 days and I really enjoyed your company. Back and I will be happy to see you again. I arrived and was met at the airport by Helen. She was very nice and spoke English very well. She has a degree in History and is well versed in the local history and culture as she is a native of the area. She found me a wonderful, clean and newly renovated apartment in downtown, within walking distance to everything. She also provided a phone so I could call her if I needed help in translation or if I met some local friends. TOUR GUIDE RESPONSE: Thank you very much, Jim for 5 stars!!! I really hope that you had great time in my city and I will be more then happy to see you again. If you will need help in future, I am always ready to help. Have great vacation!!! Helen was charming and shared so many wonderful parts of the city with us.....excellent guide with great information and warmth...flexible to all our wishes and perfect for our needs....especially nice was the suprise coffee shop with the best strudle ever !!!!! Perfect Day !!!!! FANTASTIC! I wish we could give MORE than 5 stars! This was the highlight of our 18 day trip to the Black Sea area - the guide was VERY informative, prepared many Ukranian dishes, and made us feel like part of the family - a day we will never forget! We booked an individual tour from Odessa to Lymanske (birth place of my wifes father (1,5h drive by car) followed by a Odessa tour. Helen picked us up at the port and her husband Denis drove us. The tour was absolutely perfect. Helen was well prepared and we enjoyed our time in every way. Hospitality and friendlieness of Helen and Denis were overwhelming. 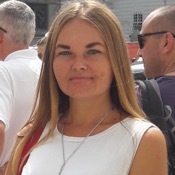 We recommend Helen for Odessa as well as for an individual tour in every respect. She is the choice for Odessa! Helen, Denis, thanks a lot! TOUR GUIDE RESPONSE: My dear Friends from Florida, thank you very much. I was very happy to provide you this tour and thank you for your invitation to join you in ballet. IT WAS GREAT TIME!!! Great commentary. Excellent English. Could not have asked for more.